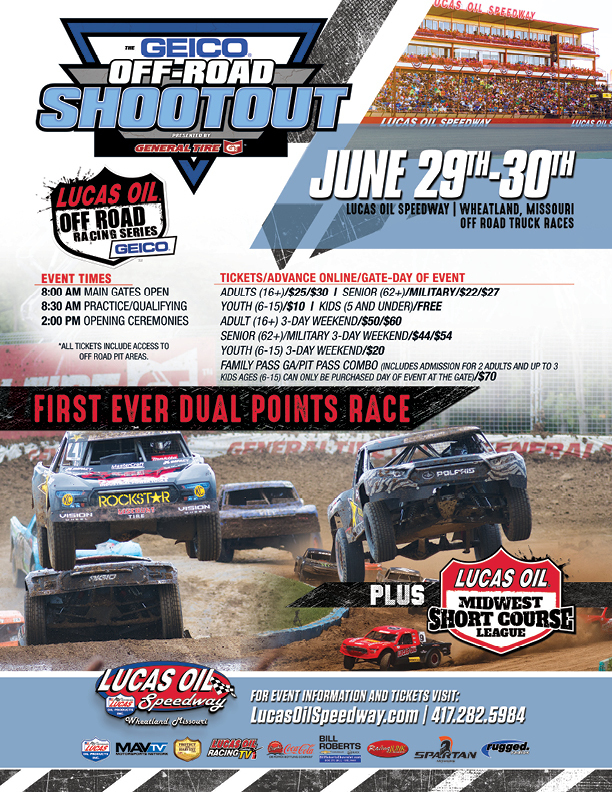 West Coast style Off Road Racing comes to the Heartland on June 29th and 30th, as the Lucas Oil Off Road Racing Series rolls in to the Lucas Oil Speedway compound in Wheatland Missouri. Bring the whole family down for an entire weekend of leaping trucks, flinging dirt, amazing thrills, smashes and crashes and some of the best racing in the nation! And when you need a break, there's food and concessions for all tastes, souvennirs, memorabilia and side attractions for all ages! There's even a full camping facilities for those who don;t want the fun to end! Get your tickets now! Tentative Sunday Event Schedule-Subject to change without notice. Family Pass Off Road Combo $70, Includes Admission for 2 Adults (16 and up), and up to 3 Youth (6-15). Can only be purchased at the front gate. All tickets include access to Off Road pit area.